Get the answers to some of the most frequently asked questions about decals and stencils. If you have a question that is not listed here please submit your questions using our contact form. Q. What's the difference between a decal and a stencil? A. Decals are the end result and stencils are used to create the end result, usually using paint. Q. Is there a special vinyl material for painting stencils? A. Although regular vinyl material that's used to make decals can work in some instances it's not made for this purpose. Stencil vinyl has a light removable adhesive that won't damage the surface. Standard vinyl material used for decals has a semi-permanent adhesive and bonds strongly to the surface. We offer two different material for paint stencils. The opaque white paint stencil vinyl is a thin material good for use on light textured surfaces and surfaces with curves. The translucent blue stencil material is a little thicker and is better suited for flat surfaces and when you need to slightly see through the stencil for alignment purposes etc. Q. 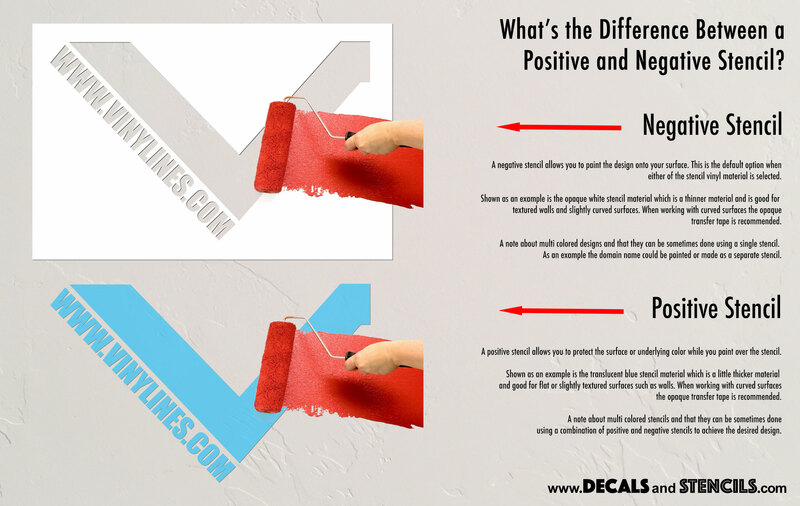 What's the difference between a positive and a negative paint stencil? A. The difference between a positive and negative stencil is that the positive will protect the surface using the designs shape while you paint over it and a negative allows you to paint the design onto your surface. The default is a negative stencil so that you can paint the design onto your surface but if you need a positive you can shop the decals and select the stencil material or if the design is not available you can use the "special instructions" box to request that your order be for a positive. Q. Are your stencils reusable? A. Yes and no. What makes a stencil reusable or not is the design. Most designs do not allow for reusability due to the inner parts not connecting to the outer parts. Think of the letter O since the inner part of the letter is not connected to the outer part it's not reusable. If you connect the inner part to the outer part then you can reuse it. Contact us prior to ordering if you want to know if a particular design is reusable or not. NOTE: Some vinyl materials work better than others for reusability. The white paint stencil vinyl is thin and not very reusable. The translucent blue stencil vinyl is more rigid and better for reusability. We can also make some stencils out of a clear non stick rigid vinyl material that costs extra. If you need this material contact us prior to ordering. Q. How long will a decal or stencil last before applying them? A. Some have had success applying decals after sitting for months but we do not recommend this. We recommend applying decals and especially stencils within a few days of receiving them. The longer your decal or stencil is not used the adhesive backing will become more permanent making it harder if not impossible to use as it will start to stick to the release liner backing paper. Q. Will decals hold up in the dishwasher? A. Yes they will hold up but we suggest not using the heated drying cycle. Q. Do you apply decals made by others? A. Maybe. We do not typically apply decals made by others as not all vinyl material is the same. If you have something that you want applied and did not buy it from please call to discuss your project. We do not yet have a retail studio open to the public. The plan is to open a design studio when the community business area is developed. I do perform some services from my home studio by appointment and I can visit your home or place of business to discuss your project or apply decals that you purchased from us.